I sure hope nothing too horrible happens to the dude with the ... actually, what is that thing? Some kind of rifle? Cliff Bleszinski's hasn't been talking much, publicly, about his plans for the future since leaving Epic. Maybe he's opening his own studio, maybe he's being lured by Ubisoft. But one thing he's definitely been doing is working on this new project, and no, we don't know what it's all about. Not yet, anyway, but since Bleszinski's confident enough to put this out on Twitter, maybe more information will be revealed soon. For the moment it's just "something I've been working on," according to Bleszinski, so it could be pretty much anything, not necessarily a game. It's probably a game. Is it a game? Well, there's a dude with what could be a rifle. Does that make it a game? "I have been going non-stop," said Bleszinski when he left Epic. "I literally grew up in this business, as Mike likes to say. And now that I'm grown up, it's time for a much needed break." That was about nine months ago, more or less. 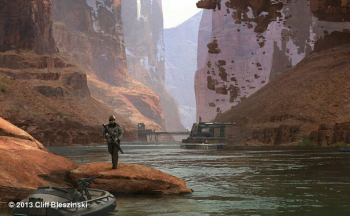 But back in January, when asked whether he wanted to start his own studio, Bleszinski said yes, and that he'd want to get back to the AAA side of the business eventually. "The type of game I want to build would not be this super-linear Gears or Uncharted type of campaign game," he said at the time. "It would be something that's much more free-flowing in regards to the number of systems that work together to create new and emergent gameplay." Possibly also set in a science fiction environment, if this shot is in any way related. Whatever it is, it won't be much like Gears, the game Bleszinski described as a "negative stereotype." But as to what it will be, all we have for now is a picture.